Dia De lo Muertos is a community-wide celebration of the history, Hispanic culture and rich heritage of the region. it is that time of the year that the spirits of loved ones who have died are thought to return to Earth to celebrate with friends and family. 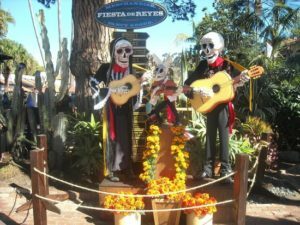 Old Town San Diego State Park will the place to be for Dia de los Muertos, or Day of the Dead. This festivities will begin October 28 and 29 - the weekend before the traditional date - and culminates on Nov. 2nd. The State Park will play host to a lively celebration full of activities and attractions that will definitely satisfy the entire family. There will be a public alter, a prize wheel, live entertainment, a beer garden, numerous craft stations, three Sunday performances of a specially written Dia de los Muertos play with professional actors, and booths featuring artists, Day of the Dead merchandise, food and drink samples, face painters and more. There will also be larger than life puppets and pinatas; sure to entertain the children. Merchants and museums in the park will host various fun activities. An alter map will available for those who wish to tour the all the alters and hosted tours will be available Saturday and Sunday. The activities will start at noon and continues until 11pm on Saturday and until 10pm on Sunday, Wednesday and Thursday. Free Parking is available across Taylor Street in the CalTrans parking lot all day on weekend days and after 5 p.m. on weekdays. Additional paid lots will be available, as well.